Money is one of the most frequently mentioned subjects of the Bible, and the amount we have governs many of our daily choices: Will we pay for a taxi across town or ride the bus or subway? Yet money divides us: Some have only two coins to their name, while others “have more than heart could wish” (Lk. 21:2; Ps. 73:7 NKJV). For exactly this reason, money is a primary means by which God’s people can show God’s compassion to those in need. It’s important to note that money is not a definite sign of God’s favor.1 The existence of rich and poor classes is part of the fabric of our world, as the Lord indicated (Dt. 15:11; Mk. 14:7). Among sinners and saints alike there are both rich and poor people. No matter what our personal incomes are, there will always be some with more – and some with less. Therefore, we should always view ourselves as those who can help the poor – even if we might be considered poor ourselves. In fact, those of us in developed countries who may feel we have little are really quite wealthy by worldwide standards.2 Although poverty can be defined in various ways, it refers to some level of deficiency in basic daily needs, such as adequate food and shelter.3 While it’s likely that poverty already existed in the corrupt days of Noah, and even in the first city built by Cain, we can be certain that it existed among the people of Israel. On numerous occasions God spoke not only of the poor but also widows, orphans, and “strangers,” a term that essentially referred to immigrants. All of these merited the consideration of God’s people. Four unchanging principles span both Old and New Testaments. • First, God’s people should not treat the poor unfairly. This includes mistreating them socially, taking advantage of them financially, and perpetrating acts of injustice against them legally. The Lord said, “If you afflict them in any way … I will surely hear their cry; and My wrath will become hot” (Ex. 22:23-24). Even unbelievers are judged for mistreating the poor, and God refused to hear the prayers of those who ignored the cry of the poor (Ezek. 16:49; Pr. 21:13). Oppressing or mocking the poor is tantamount to reproaching God (Pr. 14:31; 17:5). Yet frequent passages in the prophets show that this is precisely what many of God’s people did; even priests and rulers had to be rebuked (Isa. 3:14-15; Amos 2:6; Zech. 7:9-14). The same behavior angered God in the New Testament (Mt. 23:14; Jas. 2:1-10). Is this not still a danger for Christians today? Even if we don’t steal from the poor, it’s easy to mock immigrants and accuse them of ruining our neighborhoods. It’s easy for a majority culture to adopt an “us and them” perspective regarding minorities. It’s easy to defraud, demean, or speak impatiently with those who seem to have a low social status: “A poor man pleads for mercy, but a rich man answers harshly” (Pr. 18:23NIV). These attitudes are simply ungodly and should not be found among Christians. • A second principle is to avoid greed. God embedded several practices in the cultural life of Israel to support this point. For example, landowners were instructed to leave the corners of their fields unharvested, leave behind anything the reapers dropped, and leave some grapes unpicked (Lev. 19:9-10; 23:22). These were for the poor. Moreover, every seven years the people were not to plant any crops. God promised that the sixth year’s harvest would provide a surplus, and anything that grew by itself in the seventh year was also for the poor (Ex. 23:11; Lev. 25:20-22). Therefore, a landowner was not to claim “good stewardship” by harvesting every last bit of produce for himself. Do we grasp our possessions greedily and cultivate extravagant lifestyles (Pr. 21:17) rather than giving to the poor what we don’t really need? • A third principle is to avoid pride. Paul wrote, “Do not set your mind on high things, but associate with the humble” (Rom. 12:16 NKJV). It’s not at all difficult for us to develop the feeling that if we have more wealth than others, we deserve more than they do and are probably a bit better than they are too. We might prefer to associate with the rich and influential rather than the poor and disrespected. Neighbors, friends, and even family members may despise the poor, but we should show mercy (Pr. 14:20-21; 19:7). God emphasizes that He does not show favoritism, and His followers shouldn’t either (Job 34:19; Eph. 6:9; Jas. 2:9). Pride also stems from a judgmental attitude towards the poor. Those with financial means may think they know why others are poor. It’s true that various Bible verses describe some factors that lead to poverty, but it is simply wrong to believe that those verses apply to all the poor! Poverty is multifaceted, and many are poor because of economic or societal factors. One Christian worker observed, “The poor are no less sinners than the rich, but they have also been sinned against. They are the victims of other people’s sins and injustices.” 4 While this is not always the case, it often happens. Furthermore, the Bible indicates that a cycle of poverty is hard to break: “The rich man’s wealth is his strong city; the destruction of the poor is their poverty” (Pr. 10:15). The calamities of life impact the poor most severely, simply because they are poor, while those with financial resources tend to weather those storms. Because of these diverse considerations, it’s dangerous and prideful to think dismissively or stereotypically of the plight of the poor, as if all poor people would not have such problems if they were only better workers or smarter with their money. • To replace pride, God gives a fourth principle: Help the poor! Many Bible verses indicate that helping the poor is a God-honoring, righteous action, akin to lending to the Lord Himself (Pr. 29:7; 19:17). God instituted a sacrificial system with inherent allowances for the poor (Lev. 5:5- 7; 14:21-22). Those who refuse to actually meet physical needs are condemned, even if they use kind, encouraging words (Jas. 2:15-16; 1 Jn. 3:16-18). The challenge comes when we try to determine how and whom to help. To begin with, what constitutes a need? Sometimes James 2:15 is used as a standard – “naked and destitute of daily food.” But perhaps it’s better to consider Titus 3:14, which urges Christians to “learn to maintain good works, to meet urgent needs, that they may not be unfruitful.” The phrase “urgent needs” is variously translated but seems to carry the sense of “an immediate need.” The Lord twice provided food for multitudes of people even though they apparently were not destitute. They had money and homes (Mk. 6:36; 8:1-3), but were simply too far out in the desert to provide for themselves. One boy planned ahead and brought a lunch – the others could have. But the Lord did not rebuke them; He simply met the need of the moment, abundantly. There are always multiple factors in this equation. Are people needy because they are not working, but could be (2 Th. 3:10-12)? Are there family members who should help first, but are not (1 Tim. 5:3-4)? However, in addition to these questions, another key point is the Lord’s compassion for the crowds He fed (Mt. 14:14-21; 15:32). Compassionate followers of Jesus will tend to emphasize grace-motivated giving rather than a checklist of eligibility requirements. The early Christians had a special concern for the poor among them. The office of deacon was first developed at the suggestion of the apostles to address an inequality among the poor (Acts 6:1-7). The task of “serving tables” is related to “deacons” in 1 Timothy 3:8 and elsewhere. Believers customarily shared their possessions and even sold their goods in order to give the money to their needy brothers and sisters (Acts 2:44-45; 4:34). Yet this was not a communistic way of life, for it was purely voluntary (Acts 5:4). Social justice is another consideration. We must emphasize that the gospel is not a message for society but for the heart. The aim of the Church is not to establish justice on the earth; that will only come when Christ establishes His kingdom in righteousness. Yet believers should always love to see justice being done (Mic. 6:8), for God hears the cries of the poor and afflicted, and He blesses those who do the same (Job 34:28; Jer. 22:16). Masters are instructed to pay workers a fair wage (Col. 4:1), and the Lord sought the protection of His disciples when they were threatened at His arrest (Jn. 18:8). Similarly, for centuries Christians have spread God’s compassion not only by preaching the gospel, but also by establishing hospitals, schools, orphanages and shelters for the homeless, thereby taking up the causes of the downtrodden in areas where God has called them to work. All these considerations form a common theme of a desire to help the poor, as opposed to acting like we cannot (Pr. 3:27-28; 13:7). There are certainly times when those who claim to have needs should not be assisted without first examining their situation (1 Tim. 5:3-13). However, the initial attitude should be a readiness to help. The apostles displayed an active, eager intention to remember the poor (Gal. 2:9-10), and Paul quoted the Lord to the Ephesians: “It is more blessed to give than to receive” (Lk. 14:14; Acts 20:35). While there are many exhortations about helping the poor, there are also principles for the poor themselves. Those in need should not demand attention from the rich. It is godly for each of us to trust the Lord for our needs; for generations He has proven Himself a faithful provider (Ps. 37:25). If poverty has come because of injustice, those in need can take comfort in knowing that God is aware, and will act (Jas. 5:1-6). If laziness, foolishness, extravagance, or a get-rich-quick scheme has caused poverty, those mindsets can be changed (Pr. 6:11; 13:18; 21:17; 28:22). Moreover, even the poor should foster the desire to give something back to the Lord (2 Cor. 8:5). All our possessions, whether many or few, are a test of our stewardship. If we cannot handle material things well, would God commit to our trust the “true riches” (Lk. 16:11)? The proper mindset of the Christian is to use every opportunity possible, including our money, for the glory of God and the blessing of others. Therefore, our thoughts should consistently include a readiness to give to those in need (Eph. 4:28). It is a principle in both Old and New Testaments that this is one essential way to demonstrate our relationship with the Lord. 1. God did give promises of special blessing to His earthly people if they would obey His words (Dt. 7:12-14). Yet sinners were also rich, and believers were also poor (Ps. 73:1-14). 3. Same as 2 above. 4. Bakke, ray, The Urban Christian, Intervarsity Press, 1987, (Downers Grove, IL), p. 75. 5. Tertullian, Apology, 197 AD, quoted at http://www.christianitytoday.com/ch/1988/ issue19 /1920. 6. 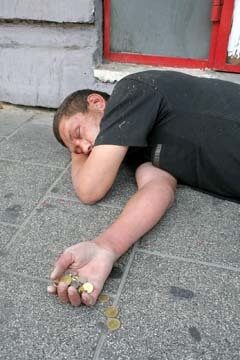 There may be modern safeguards to consider: Is the needy one a drug addict, or a con artist? But following Peter’s lead, we can be ready to give what we do have available. It may be that we don’t always have something available, and the Spirit of God may prompt us to exercise caution at times; but readiness to help the unknown poor on the street appears to be a godly trait. Great reminder about how to live the Kingdom of Heaven. Thank you!